Cintiq 27QHD and Cintiq 27QHD touch feature large working surface as well as best-in-class pen-on-screen and colour performance. Tokyo, Japan. 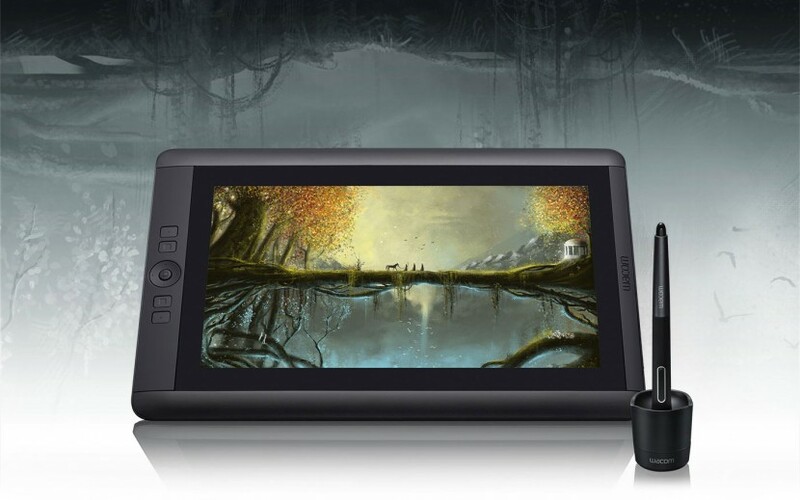 – Jan. 6, 2015 – Today, Wacom launches the Cintiq 27QHD and Cintiq 27QHD touch to meet the increasing demands of creative professionals. Featuring the very best in pen-on-screen performance, Wacom’s new flagship Cintiq will delight artists and designers with its large, edge-to-edge glass working surface, spectacular colour and attention to ergonomics. The 27” display delivers a seemingly infinite surface, literally letting artists and designers see the bigger picture. To help support a natural and intuitive workflow, the Cintiq 27’s new ExpressKey™ Remote, which can be placed anywhere on the screen or desk, gives users more flexibility and power as to how, when and where customisable keyboard shortcuts and modifiers are implemented. Additionally, the Cintiq 27 offers a variety of stand options, providing users the freedom and flexibility to comfortably work with the Cintiq at varying angles for hours and hours. True to life – excellent colour performance and colour management Professionals with colour critical workflows will benefit from the Cintiq 27QHD’s life-like colour quality which displays 1.07 billion colours and 97 percent of Adobe’s colour gamut. When it comes to any high-end creative production in art, design, image editing and 3D animation, the Cintiq is the creative tool of choice as artists can be certain that the colours match the printing or other output phases of a project. This is thanks to precision colour matching with the Wacom Colour Manager, Powered by X-Rite (purchased as an accessory at the Wacom eStore), that sets the colour and allows for fine tuning them for a near exact match. Members of the Laika animation team, makers of the films The Boxtrolls, ParaNorman and Coraline, uncover the Cintiq 27QHD’s “rich and vibrant” colour performance here. Without any physical or visual clutter on the work surface, users can enjoy more space and freedom for creativity than ever before. Chris Tran, CG Modeler and his Laika colleagues, discuss the importance of the Cintiq 27QHD’s “ideal” size. Both versions of the new flagship product feature a 27” 2,560 x 1,440 seamless edge-to-edge glass screen. The extra wide viewing angle enables designers, artists, game or film developers to create rich, detailed, large-scale work directly on the screen. Users can incorporate different pen nibs to increase the natural feel, including the felt nibs, which provide a realistic pen on paper feel. The Cintiq 27QHD enables users to enhance and speed up their workflow, as they benefit from a combination of pen, multi-touch (Cintiq 27QHD touch), on-screen controls and a Radial Menu. Pen performance remains the key ingredient to the whole creative pen display experience and the Cintiq’s Pro Pen emulates the feel of a traditional brush or marker. Users can draw, paint, design and edit directly on screen with the Wacom pen and its 2048 levels of pressure sensitivity. CG Texture artist from Laika, Holly Webster, explains how “there is nothing that comes close to the control and precision” of the Cintiq 27QHD pen. The Cintiq 27QHD touch is the ideal solution for those who want to experience simultaneous pen and touch with the latest touch enabled OS and software. It provides an even more intuitive and natural way to work by closely replicating the experience of working with two hands when using traditional materials such as paints, markers and clay. Multi-touch allows users to directly manipulate their work with fingers by rotating, pinching and moving it around. The ability to manipulate a 3D model or pan, zoom and rotate an image with one hand while simultaneously sculpting or sketching with the other delivers a completely natural experience, enabling artists to stay completely in their creative zone. As with its predecessor, the Cintiq 27 offers best-in-class ergonomics that especially benefit graphic designers and illustrators who work long hours and have to be very precise. Professionals will appreciate the choice of stands that are available, allowing them to find their favourite working position for maximum comfort. The integrated stand means the Cintiq can be either laid flat (five degrees to be exact) similar to a canvas or positioned at a 20-degree angle by extending the legs. An optional Cintiq Ergo stand or 3rd-party VESA arm give users the option to adjust the position even further to whatever angle works best for them, whether sitting or standing.